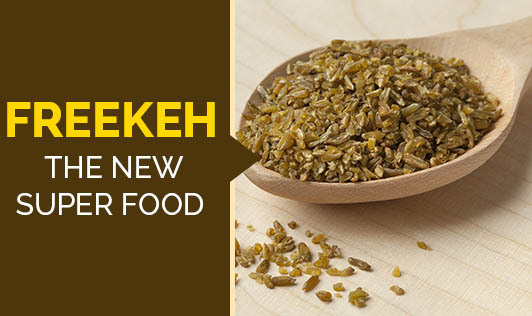 Freekeh or Farik has always been a part of the Middle Eastern and Mediterranean cuisine. It has recently gained popularity in the American kitchens for its nutritional benefits. Freekeh is nothing but durum wheat which is harvested while the grains are still unripe, soft and full of moisture. The grains are sundried and set on fire and then rubbed to be used as whole freekeh. • Whole freekeh( uncracked): In this, the grains go through the trashing and rubbing process only once. They take about 45-50 minutes to cook. • Cracked freekeh: Cracked freekeh go through a second round of trashing and rubbing to form smaller cracked pieces and take only 15-20mins to cook. 40 grams of Freekeh gives130 calories, 1gram of fat, 26 grams of carbohydrates, 8grams of protein and 4grams of dietary fiber. Why is freekeh a superfood? Cooking freekeh is extremely easy. You just need to add 1 cup of cracked freekeh in 2 cups of water and cook it for 15 mins. If you're using whole freekeh, add 3 cups of water and cook for 35-40mins. How to incorporate freekeh in the diet? Freekeh can be used to make risottos, stir fries, soups, upma or can be simply used in place of rice. Having talked so much about freekeh, the challenge still lies in finding this delicious grain in the Indian market. Hopefully,as it gains popularity, it will soon make its way here.